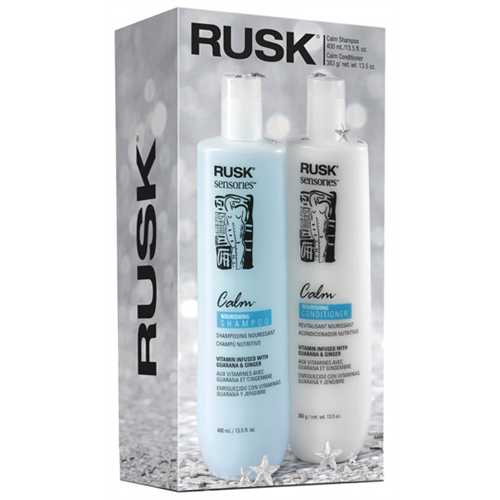 Calm Shampoo and Calm Conditioner reawaken the senses and gently nourish troubled, stressed hair. Formulated with guarana extract to give hair a healthy, natural sheen, and ginger extract to maintain the hair's natural moisture balance. Calm Conditioner is also formulated with amino acids and naturally derived vegetable proteins that add strength and body to the hair. RUSK Sensories invigorating botanical aromas and soothing formula colors are a wonderful sensorial experience. All formulas feature CFT (Compressed Formula Technology), uses 30% to 50% less product and achieves twice the performance.